I’ve been putting off writing. Because every time I sit down, there is only one thing that presents itself in forefront of my brain. And this “thing” immediately leads to a sad, twisted up knot in my stomach. But I’ve finally decided to stop fighting and go face to face with it. My friend Hannah is suffering a terrible loss. Last week she lost her very best best friend. Her husband. Here was a man who was a constant example of what it really means to live the life you love. 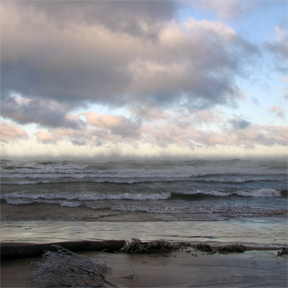 Tragically and unexplainably, the untamable waters of Lake Superior took the life he was so passionate about. Jimmy only got 34 years in. But he made the most of them. And Hannah, through her grief, is graceful enough to embrace the fact that Jim died doing something he loved. Ice fishing. If Hannah can find solace in this, shouldn’t I too be able to focus on this tiny pin-prick of light? I see it, but it keeps darting around. Because no matter how you cut it, I just don’t want Hannah to have to accept a new reality. Like always though, Hannah is charging though life, already ten steps ahead of me. I don’t know who poured all of the strength into this petite, firecracker of a woman, but she is brimming with it. And that, at least, is something that brings me hope. I’ve been ruminating all week on what it means to be passionate. It’s not an easy topic (at least not for me, anyway, and I’m fairly enthusiastic about life). How do you find your true passion? And once you’ve found it, how do you incorporate into your life? In essence, how do you become your passion? And what do you do if you get stuck along the way? I don’t know the answers, but I figure I owe it to Jim, to Hannah, and to myself to really put some effort into it. We all do. Image a world where everyone radiates such a love of living. Jim “got it.” He figured out the answers to these complex questions. And Hannah gets it too. She credits Jim for teaching her how to love life and never do something you don’t love, but I know they fueled each other on this. The truly amazing thing, though, is that I’m pretty sure this tragedy will only set Hannah’s flame for life even higher. That’s how well she gets it. And if that isn’t a kick in the pants to give your life an honest to goodness assessment, I don’t know what is. I’m continuing to send every drop of love and strength I have to Hannah, but now – I realize – it’s with my eyes wide open, my ears pricked, and my heart a little more exposed. I’ve been slapped with the message that it’s time to sit up and pay attention. And at the moment, there are only two people I can thank for the call. Hannah needs love and support, but she also very clearly needs chocolate. Preferably topped with Nutella. In a medium bowl, toss the graham crumbs, milk powder, sugar and salt with your hands to evenly distribute the dry ingredients. Melt the butter in a small sauce pan. Let cool slightly and whisk in the cream. Add to the dry ingredients and toss again to evenly distribute. The mixture should hold its shape if squeezed tightly in the palm of your hand. If it is not moist enough, melt an additional 1 tablespoon of butter and add it to the mixture. Set aside. 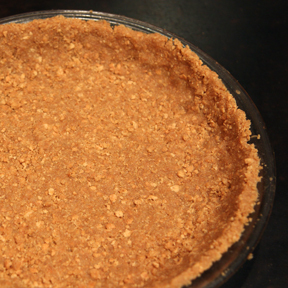 Press about 1 1/4 cups of the the graham crumb mixture into a 10-inch pie pan, working it evenly up the sides. Add another 1/4 or so of crumbs if you need to fill in anywhere. Set the remaining graham crumb mixture aside. Combine the chocolate and butter in a heat proof bowl set over a pan of simmering water and gently melt them together on low heat. Stir until the mixture is glossy and smooth. Set aside. Switch to the paddle attachment and slowly drizzle the chocolate mixture into the eggs on low speed, then increase the speed to medium for about 1 minute Scrape down the sides of the bowl. Add the flour, cocoa powder and salt and paddle on low speed for another minute or so until there are no clumps. Stream in the cream on low speed, mixing for 30 to 45 seconds, until the cream is just mixed in. Fill the pie crust with the filling, put the pie pan on a sheet pan and bake in a 350º F oven for about 25-30 minutes until the pie is slightly puffy and set in the middle. Cool and serve with a dusting of powdered sugar. 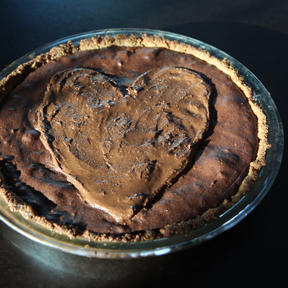 Or, (particualarily if you are making this pie for Hannah) spread a thin layer of Nutella over the top. I’m so sorry you lost your friend. Love and prayers to Hannah, and to you, as you find your true north. I know you will! and the serendipity continues. I love your beautiful words about Jim and Hannah and garlic too. I see the pinprick of light too, through tears. Well said and a daily lesson for all of us. Thanks, Jill! Heck of a post Jill, thoughts to you and your friend. thank you for beautiful words and love. essence is the word I keep thinking about after reading…finding ones essence…. Wow…it’s amazing how such a tragedy can bring so much “beautiful”. I believe that’s called Faith and Love. Peace. May God keep you in his grip Hannah. Everyone needs that kick in the pants. Thanks for expressing it so eloquently. Thanks for trying to put such a painful loss into words,and sending on your positive energy.